Seen here on the Hobart Slip have a very long overdue clean and repaint. 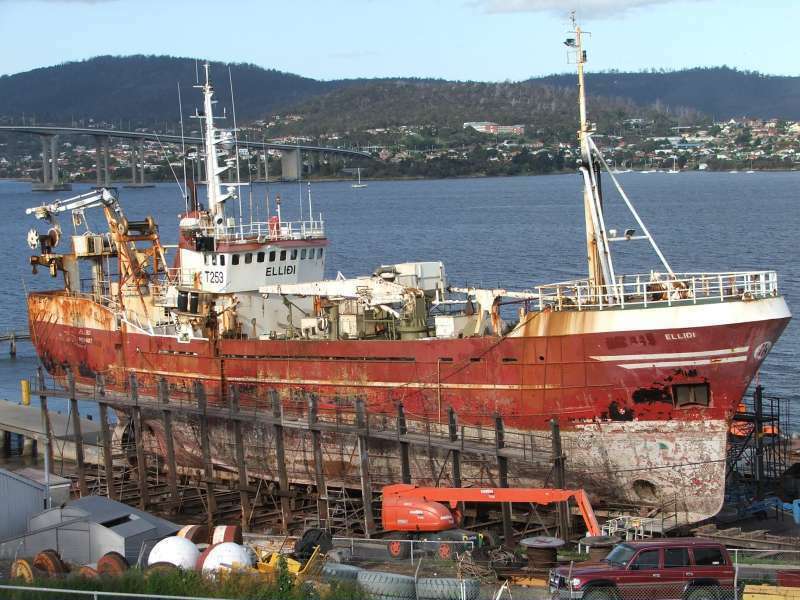 This trawler is based at Triabuna on Tasmania's east coast and fishes for Jack Mackeral, but by the looks of her she has not been to sea for quite a while. I am not really sure it is still in Tasmanian waters. She left the Hobart slip painted Navy Blue with a white strpe the length of the hull. The larger Jack Mackeral Trawlers only come down to Hobart for the Sliping for inspection and repaint as they are based on the east coast of Tasmania. Haven't seen any of the others down here for a while either. Thanks for the info. In 1996 it was sold to Akranes in Iceland and became GK 445 "Ellidi". I don't know when it continued to Tasmania under same name. Thanks for that Info, I have had not had a chance to get to the library to look in Lloyds yet. Now I have information to complete my records. Last time I was up at Triabunna there was 4 vessels like this and when I was up at Devonport last there was 2 sitting at anchor there also. Familiar indeed! Built 1979, Voldnes Skipsverft A/S - Fosnavaag, Y/No 24 as Quantus PD 379 (UK flag / Peterhead). As far as known aquired by Seafish Tasmania in 2002. Now registered Hobart, Tasmania. LR/IMO No 7825605. Looks like she's been lengthened at some time as original loa 43.52m and 580gt. 2005 figures show loa 50.50m and 731gt. By the looks of her i'd say she was an ex-Norweigan purser built in the 1980's. There are a lot of design details that are very similar to Norweigan ships of that era so it would be interesting if anyone can put an original name and builders yard to this ship. This photo has been shown 2,213 times since it was added to the site.